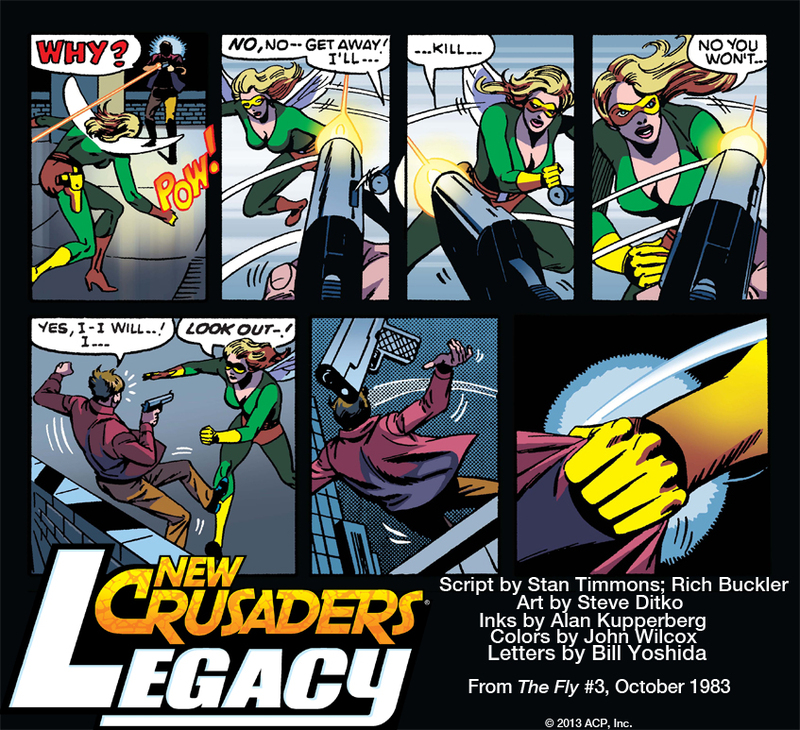 There’s less than a month until New Crusaders: Legacy arrives in comic shops. 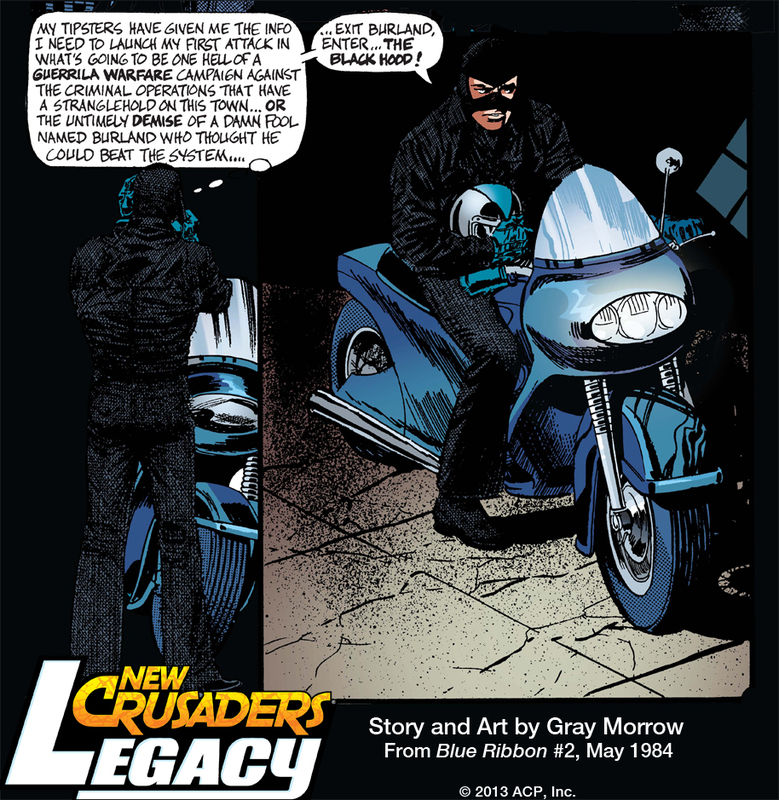 Here is some info about the title: New Crusaders: Legacy is a unique graphic novel collection from Red Circle Comics using an innovative blend of NEW and CLASSIC material. Picking up directly following the events of New Crusaders: Rise of the Heroes, our new team of young heroes struggle under the tutelage of the world’s first patriotic super hero: the Shield. The Shield teaches these New Crusaders about the early history of their parents, the Mighty Crusaders, seen by the reader in the form of some of the best classic tales from the 1980s Red Circle super hero titles. Featuring legendary comic artists such as Steve Ditko and Alex Toth! This Black Hood panel is from the story “Black Hood.” It originally appeared in Blue Ribbon #2, released in May 1984. It features story and art by Gray Morrow. This Comet panel is from The Comet #1, which was released in October 1983. It was written by Bill Dubay, with pencils by Carmine Infantino, inks by Alex Nino, colors by Tom Ziuko and letters by Billy Dubay, Jr. This panel is from “The Fox,” originally featured in Black Hood #2, released August 1983. It features story & art by Alex Toth and colors by Barry Grossman. This Fly-Girl panel is from “Faithfully Yours,” originally featured in The Fly #3, released in October 1983. It was written by Stan Timmons and Rich Buckler with pencils by Steve Ditko, inks by Alan Kupperberg, colors by John Wilcox, and letters by Bill Yoshida. We hope you enjoyed that exciting sneak peek. There’s much more where that came from in NEW CRUSADERS: LEGACY, in comic shops July 10. Pre-order your copy today! And keep up-to-date with all the news from the Red Circle Universe (including updates on the upcoming Fox series by Dean Haspiel and Mark Waid!) by following New Crusaders on Twitter and ‘LIKING’ the New Crusaders Facebook page!